Paul Craig Roberts asked: “Is the US Government Criminally Insane?” Judge for yourself from what’s going on. Trump’s lunatic fringe war cabinet should terrify everyone – comprised of Defense Secretary “Mad Dog” Mattis, hawkish imperial spear-carrier Mike Pompeo at State, generalissimo White House czar John Kelly, geopolitical pyromaniac Nikki Haley as UN envoy, and now raging hawk John Bolton as national security advisor. They comprise a hugely dangerous rogue’s gallery of hot warriors, favoring endless wars of aggression, rejecting peace and stability. 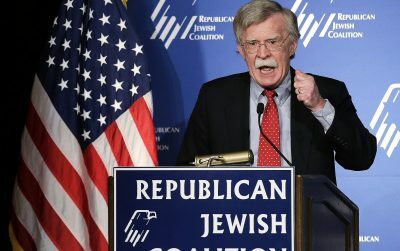 Bolton is long on premeditated aggression to solve geopolitical issues, short on what a national security advisor is supposed to be – serving as an honest counselor to the president on world issues, not pushing advocacy for his or her own agenda. He supports removing Syria’s Assad forcibly, claiming (nonexistent) Iranian and Hezbollah expansionist aims must be stopped. He’s a vocal critic of diplomacy over belligerence, including hardline toughness against Palestinians. In 2016, he addressed the Islamophobic American Freedom Alliance on whether Islam and the West can coexist. He represents the lunatic fringe of neocon ideology, an interventionist on steroids. His appointment, along with Pompeo at State, indicates abdication of world peace by Trump and his war cabinet. Warriors have a stranglehold over US geopolitical policies. PCR is right believing a criminally insane cabal is running things in Washington.